Is Best Buy's Stock Cheap by the Numbers? Let's see what those numbers can tell us about how expensive or cheap Best Buy (NYSE: BBY) might be. Best Buy has a P/E ratio of 9.6 and an EV/FCF ratio of 10.3 over the trailing 12 months. If we stretch and compare current valuations with the five-year averages for earnings and free cash flow, we see that Best Buy has a P/E ratio of 10.5 and a five-year EV/FCF ratio of 12.8. A one-year ratio of less than 10 for both metrics is ideal. For a five-year metric, less than 20 is ideal. Best Buy has a mixed performance in hitting the ideal targets, but let's see how it stacks up against some of its competitors and industry mates. In the past five years, Best Buy's net income margin has ranged from 2.3% to 3.7%. In that same time frame, unlevered free cash flow margin has ranged from -0.9% to 5.0%. 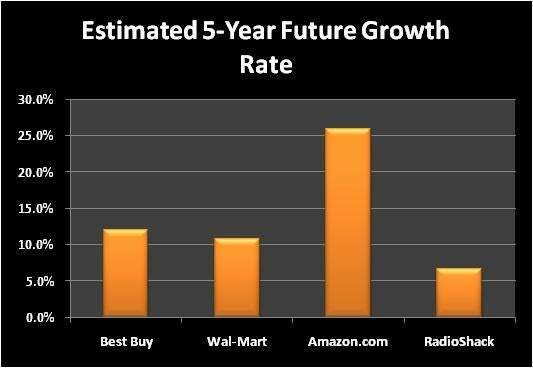 In addition, over the past five years, Best Buy has tallied up five years of positive earnings and four years of positive free cash flow. Let's start by seeing what this company's done over the past five years. 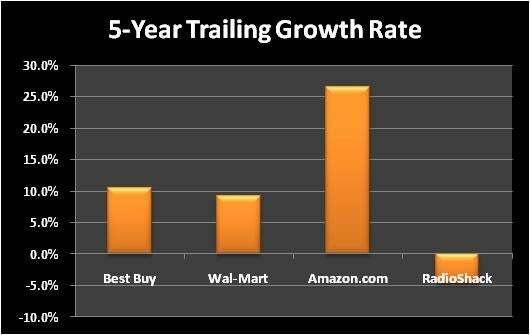 In that time period, Best Buy has put up past EPS growth rates of 10.5%. Meanwhile, Wall Street's analysts expect future growth rates of 12.0%. The pile of numbers we've plowed through has shown us the price multiples that shares of Best Buy are trading at, the volatility of its operational performance, and what kind of growth profile it has -- both on an absolute and a relative basis. The more consistent a company's performance has been and the more growth we can expect, the more we should be willing to pay. 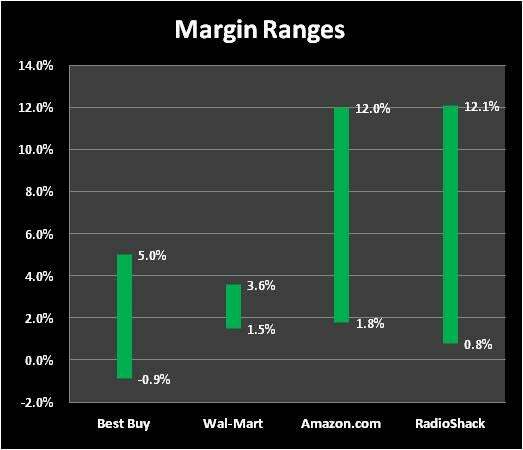 We've gone well beyond looking at a 9.6 P/E ratio, and based on the initial numbers, both Best Buy and Radio Shack look pretty interesting if they can hold out against stiff competition from online shops such as Amazon.com and mega-retailers such as Wal-Mart. If you find Best Buy‘s numbers or story compelling, don't stop here. Continue your due-diligence process until you're confident that the initial numbers aren't lying to you. Interested in reading more about any of these stocks? Add them to My Watchlist to find all of our Foolish analysis. And for more stock ideas, check out this recent article: "34 Expert Analysts Uncover Outstanding Dividend Plays."